Now Available at Barnes and Noble! A STONE UNTURNED is now available on Barnes and Noble! Get your copy here. “Can you wash my back?” Mo asked. Nia gritted her teeth. No doubt he’d try to yank her in the tub to wet her clothes so she’d have reason to stay longer. She’d deliberately used more scented bath wash. Mo would have liked nothing more than to show himself to her. But the fluffy white mounds of bubbles allowed her to see no further south than his pecs. She neared the tub with as much anticipation as a prisoner heading to a cell. Without a word, he handed her the washcloth. Bending, she drew the fluffy, white Egyptian cotton across his shoulders. Suds dotted the intricate circles of the tattoo covering his right shoulder and part of his back and chest. Every male in his family possessed it. She gritted her teeth as the memory of tracing the black symbols with her tongue broke free from her memory banks. “Feels good.” His voice, deeper than its normal tones, shocked her back to the present. Refocusing on the task at hand, she washed his back, determinedly not paying attention to the intricate markings. She straightened and handed the towel to him. He took it, but held onto her wrist. “Can you hurry and finish?” She didn’t want to talk about them. Their time together fit perfectly in the corner of her mind allotted for past mistakes. He released her. The man weighed over two hundred pounds of mostly muscle. Despite whatever floated in his system, she was free only because he let go of her. She returned to the spot of safety near the shower. Behind her, water sloshed and then the sound of a towel rubbing against skin. Without looking at him, she headed to the door. She paused, but didn’t turn around. “Come here.” A strand of pleading wove through his command. She shifted from one foot to the other, hands clenched at her sides. “I need you.” The words were low, filled with longing. She watched his progress in the mirror. “Why?” She shot back. “Want to feel you.” The words sounded gruff as if he didn’t intend to utter them. She recognized the need to reaffirm life by grabbing onto the familiar. Near-death situations prompted such actions all too often. She couldn’t let him touch her. After seeing him lying on the floor, she wasn’t certain her body wouldn’t wrap itself around him and refuse to let go. With the sound of her name spoken in his baritone, the weight of the past crashed around her like shards of broken glass leaving too many wounds, too much blood, and too little time to heal. Before he could touch her, she squared her shoulders and left the room. She closed the door with a click. Funny, it rang with the same finality as it had a year ago. Only this time, Mo was the one on the other side of the door, and she was the one walking away. Recently, I was asked by a friend whether character or plot comes to me first. My answer? Definitely character. Whether it's a flawed person viewed irredeemable by society, or someone who exudes so much life that you it uplifts your own, each in their own way is fascinating. To me, character creates the plot. Let's suppose we have a doctor who feels his skills aren't on par with his colleagues and he allows his feelings of inadequacy to draw his attention away from a patient during surgery. If he leaves an object inside the patient and is subsequently sued, we can build an entire plot from his negligence. But did the plot come first? No, the character did, who was affected by the inner conflict of not being good enough. People are the most interesting subjects in the world and to be able to create a hero, heroine or villain and learn what makes him or her tick, makes my day. So, life dealt me a painful blow of parental loss, but now that I've dug myself out of the mire of sadness, it's back to writing. Thank you for bearing with me! 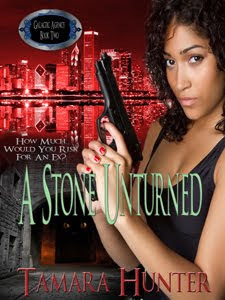 A Stone Unturned is live on Amazon and will be available soon on Barnes and Noble and Smashwords. I hope you enjoy reading about Mo and his lady love, Nia. She's a stubborn one, but I think Mo can handle her.